Erzulie Red Eyes - Honor to Erzulie Dantor! Erzulie Dantor is considered to be the lwa of motherhood - single motherhood in particular. 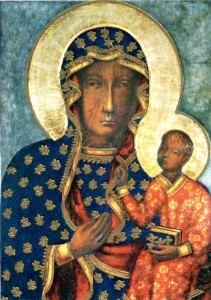 She is syncretized with many saints, especially the Black Madonna of Częstochowa. Wife of Ti-Jean Petro, wife of Simbi Makaya! 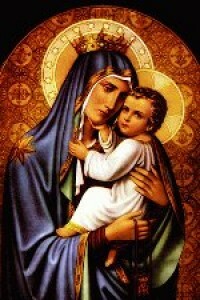 Mama Dantor, my protector, come and help me, I need you! Come here I beg you and eat this food! Erzulie Dantor, my mother, you see this food? You see this Creme de Cacao? Please give me protection, joy, love, confidence, magic, health, abundance, and wealth. 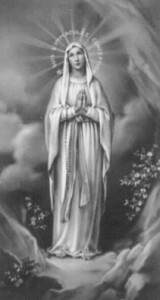 Please give me protection and strength. Papa Legba open the gate for me! Atibon Legba open the gate for me! When I return, I will thank the lwa.